Dinner at Don’s… wow, quite the spread! 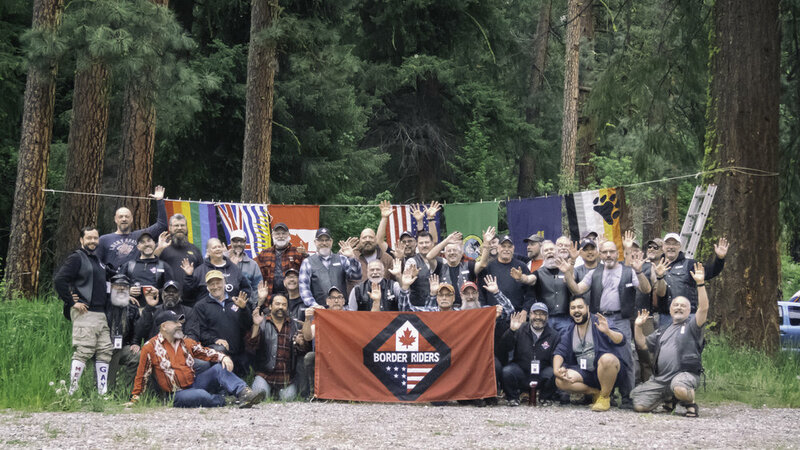 BRMC has hosted the riding season kickoff each year for 49 years on Victoria Day weekend. 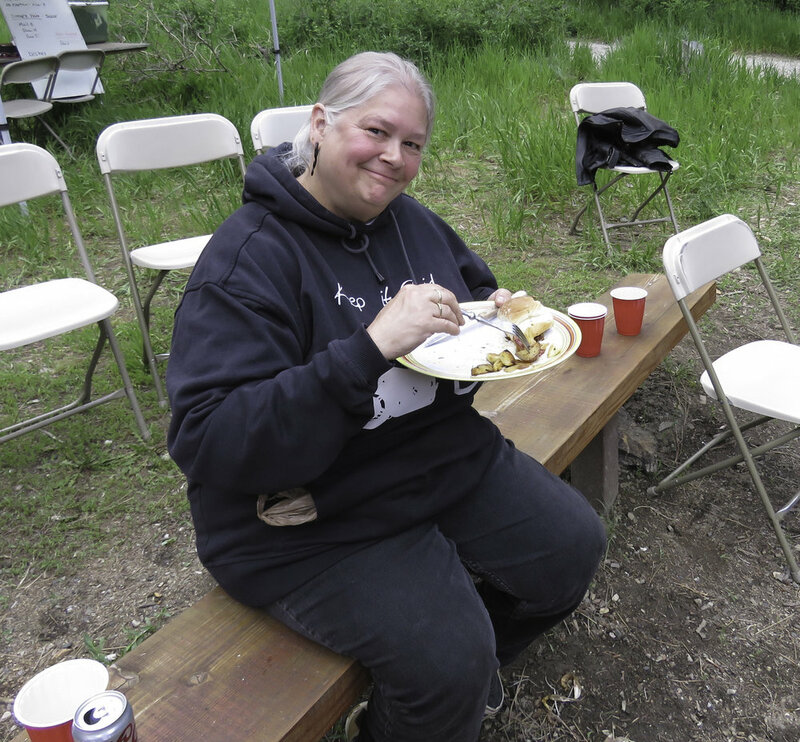 This year, our 50th, again will be held at the US Forest Service Pine Flats Campground near Ardenvoir, Washington. This primitive campground is fully reserved for BRMC, where seclusion and privacy is a feature of this central base camp for day rides throughout the central Washington area. We truck in a full kitchen to provide breakfast and dinner meals for the weekend. This event also allows 4 wheel vehicles (except RVs), so you can bring your non-riding partner or friends as well as that tent that is too large for your bike (but really, we are a motorcycle club, so at least try to rough it out). We expect a good group that always has a great weekend. Early registration gets you a discount. All vehicles (except RVs) welcome, no pets. This year to help celebrate the club’s 50th Anniversary we will have some new games and events. See the website for additional information. Registration closes May 13th at 9:00 pm. Registration is $135 US Members, $101 Canadian Members, $150 US Guests and $112 Canadian Guests. Guests require a member to sponsor them for this event. If you don't have a sponsor and would like to attend please send an email to captain@borderriders.com for information. The view from a high flying drone. The March meeting was held at the Shoreline Home of Don W. and Jorge B. Some of the attendees rode their bikes to take advantage of the warm sunny day which was a pleasant change in the weather earlier in the month. Of the twenty-four attendees, eighteen were members and six were guests. People began arriving before five o’clock and enjoyed socializing as well as the huge array of snacks provided by the hosts. Before this meeting at Don’s house, we all had experienced taking Don’s polished rock souvenirs home that he often shared at various club runs. This time, at Don’s house, we were awed by his collection of all kinds of interesting geologic relics. This of course, includes the writer of this piece. Just before six o’clock, Jeff C. began rounding up the members for the monthly meeting. Discussions at the meeting focused on two main topics: The plans for the May Victoria Day Run and the club’s Fiftieth Anniversary Rally and other activities to celebrate this important year for the club. Announcements were made regarding the Meet and Greets and day rides taking place in Portland and Seattle. After the meeting we feasted on a dinner of roast prime rib that Don had spent the whole day preparing. The roast was accompanied with two choices of vegetables and tossed salad. Dinner was finished off with four different flavors of tiramisu. We couldn’t resist having seconds! After dinner we gathered outside in the street in front of Don’s house for our usual monthly group picture. 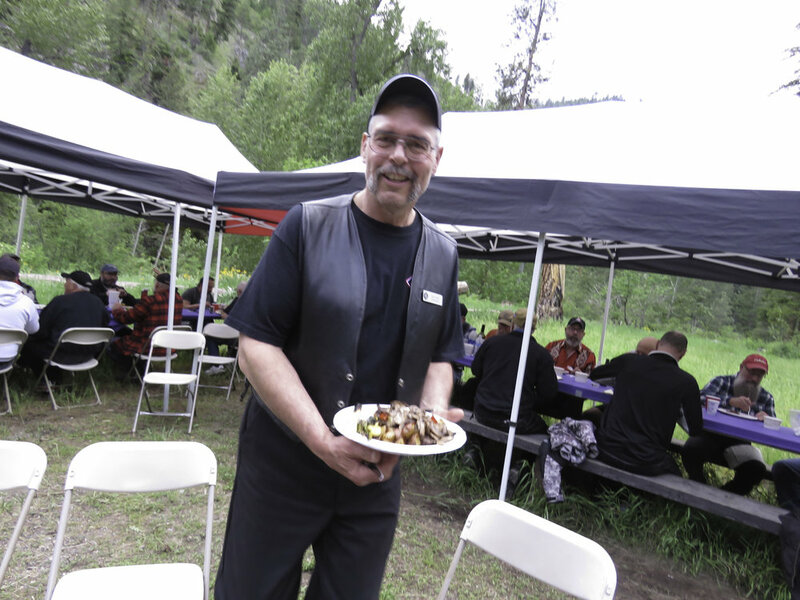 Don had put together a great selection of his photos from various BRMC runs and events as well as a few other motorcycle events he had attended. He had these displayed on several video screens scattered around the house. The evening’s socializing continued with some leaving about a half hour for the ride home while other lingered into the later hours. 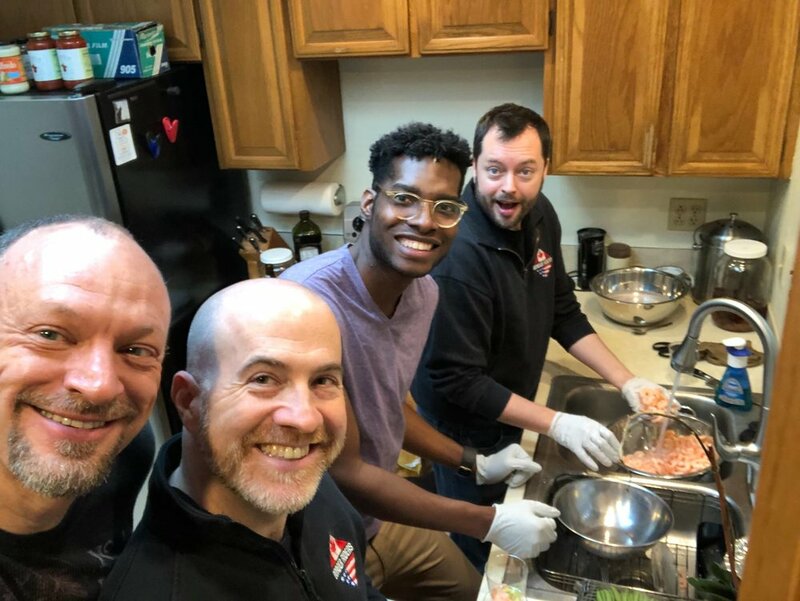 March Club Meeting @ Don’s : Food prep! First off I would like to extend a big thank you to Don W for hosting the April meeting. Don was assisted by his boyfriend Jorge and between the two provided a scrumptious meal. Don was very gracious and donated the meal fee back to the club for the benefit of the 50th Anniversary Fund. Our 50th Victoria Day is just fast approaching and our Vice President, along with other board and club members are busy making plans for the weekend. If you haven’t already done so, please reserve the dates and plan to join us. The official run dates are Friday, May 17 through Monday, May 20; however, many arrive a day early on Thursday and most depart on Sunday. 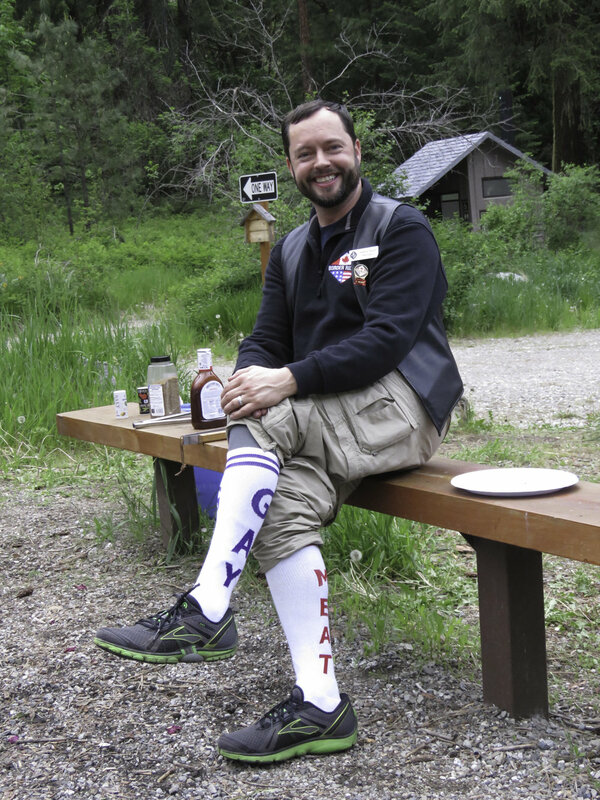 Some stay over until Monday and enjoy another day of camping and camaraderie. Registration is now open and I encourage everyone to register early as this helps with the planning. The price for registration is the same as last year at $135 for members and $150 for guest (before the exchange rate adjustment). At the April meeting the duty roster will be circulated with everyone requested to volunteer for various duties and tasks. We worked hard last year to reduce the number of shifts required. One of the best ways to get to know your fellow members and guests is by working alongside them. Thursday afternoon will involve moving all the camp gear out of storage in Entiat and to camp. If you are available to help please consider coming over on Thursday to assist. Grocery shopping and camp set up will be completed on Friday morning and afternoon. Again this is a big task that requires many hands to get the job done. Being able to have everything stored in Entiat and the shopping all done in Wenatchee has saved the club money and time in prepping for the weekend. Once again we will have meal captains to oversee the preparation of each of the four meals. The menu will be basically the same as last year with a few tweaks being made to the breakfast menus to reduce the amount of work involved. 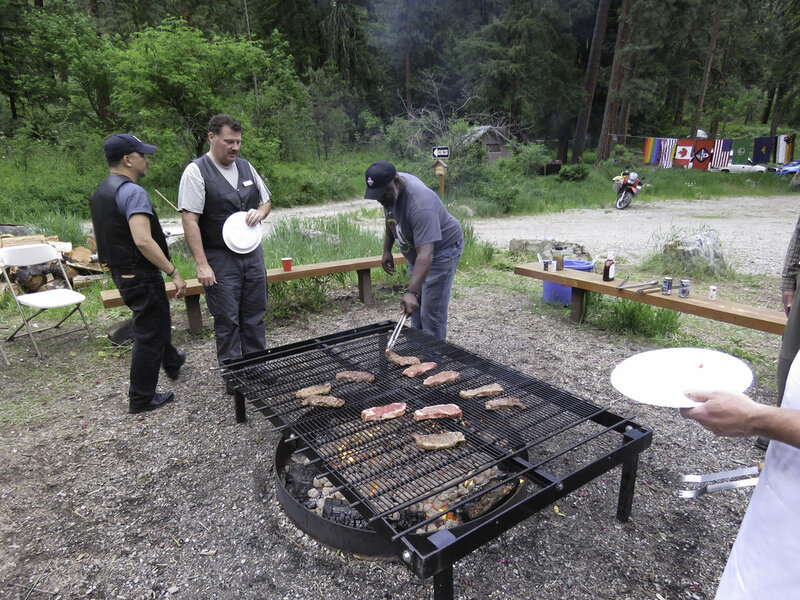 As always we are prepping for some great food at camp. Chris L has been busy coming up with some games and activities for this year’s Victoria Day. Also, this year the club will be providing a run gift. It has been several years since a run gift has been included and to help celebrate our 50th Anniversary we will have a gift for all members and guests. Lastly, if you haven't had your bike out yet this year, be sure to do a thorough safety check before hitting the road. Also be sure to have the bike serviced and clean up that riding gear. As always if any of you have any questions or concerns about the club please feel free to contact me at president@borderriders.com. I hope to see you all at our meeting on April 20th. We had four members and one guest present at the Seattle Meet and Greet in March. Chris, Jeff and Tim met for Thai food at Manao Thai Street Eats and just as we were sitting down, Cale and Dennis came along and joined us. After dinner we went over to the Cuff. The April Meet and Greet will be on April 17th at 7:00 pm at the Cuff Complex. Come out and join us. A month ago we were still flirting with snow, now the days are longer and riding is a lot more appealing. The board has been working on preparations for Victoria Day and Dan and I have been working primarily on food. We’re trying to simplify a few things and reduce the workload yet still maintain quality. After a couple of years of some dampness we’re due for a nice dry weekend. I’m still hoping for people to send me some of their favorites for planning trips for next year. With the Meet and Greets back in place in Seattle it’s time to get day rides going again. The 10-day forecast doesn’t look real promising for the first Sunday in April, but it doesn’t look like a washout either. Washington members watch for an email late in the week if it looks probable. Sometimes it takes a whole tankful of fuel before you can think straight! A big shout out to Don & Jorge for hosting the March Meeting. Your spread was both impressive and delicious. Also, three big cheers to Don and Jorge who donated 100% of the meals ticket price for this event to the 50th Anniversary Fund, WOW. Club members and actions like these continue to impress me and make me proud to be able to call you guys a brother. Thank you very much Don & Jorge. Club finances are fine. Bank balances are where I expect them to be. I hope to have Financial Reports done before the May Meeting. I doubt I will be able to get current between 4/16 & 4/20. I plan on sleeping, doing laundry, and napping through re-runs of Cimarron during most of that time. I will get our Financial Reports current and posted to the members only area of the website ASAP. Thank you for your patience during tax season. Portland had one Meet & Greet “M&G” in February and it was barely attended. Or is it bearly attended? I want to thank Blue for taking the helm for this meeting. I simply couldn’t make it. Thank you Blue! Do to the lack of interest, there was no day ride in the Portland area in March. I will not be able to go so if anyone would be willing to go please contact me and I will be happy to put something on our Face-Book page reminding people to go and who to look for. What a Segway, don’t forget, Portland’s next M&G will be on “Wednesday”, April 3rd at the Eagle on Lombard at 7:00 pm. Jeff B will be leading this meeting so stop by and say hi? Keep in mind that if you decide to go for a ride and would like someone to ride with, you can always post something on our FB page. Hopefully you’ll get a response and have someone to ride with. If you are not familiar with our FB page and need help finding us, please contact me via e-mail, Treasurer@borderriders.com and let’s get you hooked up. 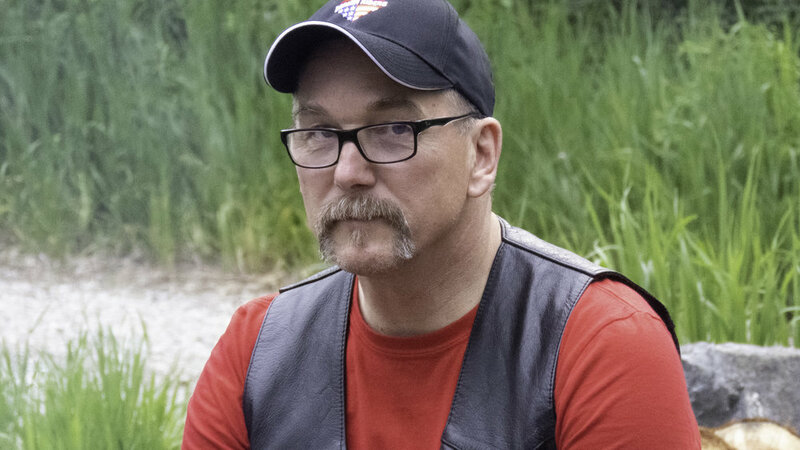 In addition to the 50th Anniversary events, I would like to bring to your attention 3 motorcycle skills enhancement classes I have set up with Team Oregon. The first is their RSP class happening on Saturday, June 1st. The second is their ART class happening on Monday, June 17th. The third is their AMT class happening on September 14th. Registration has opened for the RSP & ART classes and only BRMC members, guest, and friends will be able to register for these classes until May 1st. On May 1st these classes will be opened to the public. We need 12 people to register for the RSP Class and 18 to register for the ART Class to keep it closed for us only. We don’t require that you be gay or male in order to attend. All we ask is that you are gay or gay friendly. These events are about learning to ride and becoming a better/safer rider in a non-judgmental environment of people who will support you and want you to succeed without being hackled by non-gay friendly people. If you have a friend or a family member that would like to take one of these classes and would be a fun addition to the event, let’s get them informed and have them register to go with us. 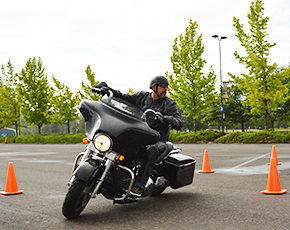 Again, to register for one of these classes, call Team Oregon at 541.737.2459 & tell them you would like to register for “The Border Riders Class on June/____/2019. They should be able to get you registered. There will likely be a social event before and after these classes. For that reason, I am asking everyone who registers to contact me at the same time. This will allow me to make sure they get invited to the whole event and not just the class. The RSP Class is already 1/2 full. Make your reservations now. This class is only 1/3 full but why wait. Make your reservations now and secure your spot in what will be a wonderful weekend full of merry men and mayhem. OK, as if that wasn’t enough training for one year, Team Oregon and I have worked out a special deal for BRMC. Team Oregon will set up a private class on Saturday, September 14th just for us. I am still working out the time for this class, but this is going to be an abbreviated version of their Police Training Course. Can you believe this? It is called their AMT or Advanced Motors Training Class. I’m so freaking excited. I think the version they are putting together for us is the one we all watch on You Tube and wish we could get a chance on that field of orange cones doing tight maneuvers, a clock ticking, music playing on a loud speaker and people cheering us onto a finish line. It turns out Team Oregon trains the police for this and they are offering a version of it to us to help us kick off our 50th Anniversary Rally happening in September. Yahoo! I doubt we will have a loud speaker and we will need to be our own cheering crowd, but the course is real, and I know many of you have dreamt about this. I know because we’ve talked about it. As Collin would have said, bounce, bounce, bounce. As if it could get any better, an anonymous donor has donated the entire class for anyone affiliated with BRMC, who would like to attend. Seriously, it’s free to anyone of us who wants to spend a couple hours playing on this course while getting feedback from their instructors. The course is in Albany, OR and it’s on the way to our 1st 50th Anniversary Rally check-in happening that Saturday night in Roseburg, OR. IT’S ON THE WAY. I believe it would be a horrible lost opportunity if we didn’t take advantage of this. I hope you gents are as excited about this as I am. What a hoot! I can’t wait! I know it will be a stretch for some of you more northern riders to get there by noon or 1 so I am hoping the Seattle and Portland people will open their homes Friday night. This will make it possible for the northerner who want to play on this course but live too far north to get to the course by noon or 1. FYI, my people at Team Oregon have said that they are going to set up 2 courses for us. The will start out the same and then one of them will become more and more challenging as our skills progress. The other course will stay the same for those who just want to practice and become more comfortable with the basic course. It other words, it’s being catered to what you want to get out of this event. Oh boy and I getting excited just typing about this event. I CAN’T WAIT! When you register for the 50th Anniversary Rally in September you will automatically be registered in this AMT Class. You don’t need to register with Team Oregon for this one. If you are able to attend the Rally on this day yet would like to attend this class, contact me at Treasurer@BorderRiders.com and let me know. I will reserve a spot for you. Either way, there will be no charge for this class. BTW, these events I put together with Team Oregon are not a BRMC sanctioned event. This is just me organizing these classes because I keep getting requests for it, I love them, and I learn something every time I go. I hope you all are taking advantage of the occasional beautiful weather days we are experiencing and are able to get out and ride. Alan did make me take a 1/2 day off last weekend and we rode out to Silverton for Lunch. I hope you gents are able to get out as well. I honestly hope to see you at one of our upcoming events and if you should have any questions or comments about anything I am dealing with, please feel encouraged to contact me & let us chat. Registration for the Rally has opened. There is a sheet on our web-site “Summary Packet” that contains a list of all the hotels we will be staying at and their contact information so you can make your reservations. There is also a day by day description of each days ride and maps for each day. You can find the “Summary Packet” and “Maps with notes” at the bottom of the day by day description. Stay tuned each month for more details and also check out the club website. Attendees can arrive any time after 3pm for socializing, the meeting is at 5pm, and dinner at 6pm. The cost is $15USD for the dinner option (Canada payments will be adjusted). You can register at http://borderriders.com. Confirmation will be emailed to you upon registration. Registration closes at 9 pm on Wednesday April 17th so we can get a head count for food. No refunds after close. Guests need to indicate a sponsoring member when registering for the meeting. We have 4 members with a birthday this month. Please take a moment to wish them a great day.